Relatively low angle route with good hands and feet. The leftmost route on the main face of the Mr. Jimmy boulder. It will be the first route you see on the Mr. Jimmy boulder if approaching from the dog walk. It is on the right side of the arete (Piss Ant is the route on the left). Immediately to its right are "Spiders from Mars 10b" and then "Venom 10a." 6 QD's and an anchor, unless I missed one on the way up. 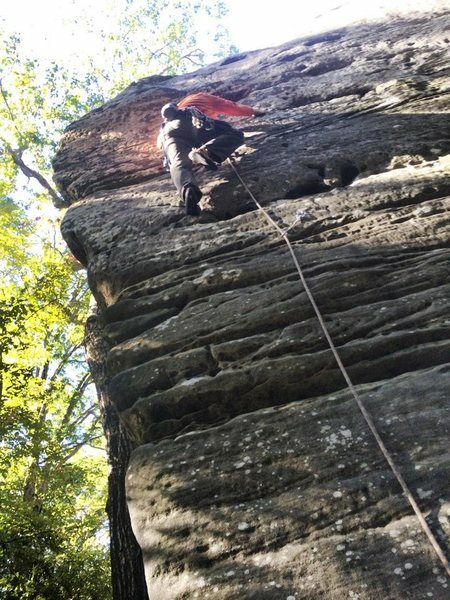 My first lead in the area-- great warm-up route. Stay to the left at last bolt for great feet. First lead in the area.